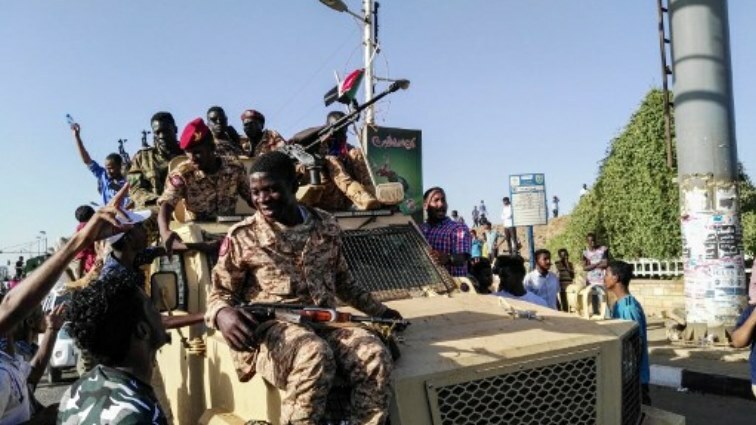 Sudan army raid group close to Bashir's party: witnesses - SABC News - Breaking news, special reports, world, business, sport coverage of all South African current events. Africa's news leader. Sudanese protesters sit atop a military vehicle next to soldiers near the capital Khartoum's military headquarters. A team of Sudanese soldiers Thursday raided the offices of a group linked to President Omar al-Bashir’s ruling National Congress Party in Khartoum, witnesses said. Thousands of Sudanese protesters camped outside army headquarters for a fifth night Wednesday demanding President Omar al-Bashir step down, as Washington voiced hope after the police ordered forces not to intervene. In what has become the biggest challenge yet to Bashir’s three decades of iron-fisted rule, crowds of demonstrators continued to throng the sprawling complex at night, singing and dancing to the tunes of revolutionary songs, witnesses said. “People are coming in droves,” said an onlooker without revealing his name for security reasons. The sprawling complex was lit up in a sea of light as protesters held up their mobile phones as torches. “I hope our revolution will achieve its goal,” said Alaa Salah, dubbed the protest movement’s “Nubian queen” after a video clip went viral of her conducting chanting with demonstrators outside the army headquarters. A student of architecture and engineering, Salah told AFP women were “widely participating” in the protests “not only for their rights but for the rights of the entire community”. The demonstrators have braved regular volleys of tear gas from members of the powerful National Intelligence and Security Service (NISS) since they began camping at the army headquarters on April 6, protest organisers say. But for the first time Tuesday night they did not face any “threat” from security agents, said a protester who requested anonymity for security reasons. That came after 11 people, including six members of the security forces, were killed Tuesday during demonstrations in the capital, government spokesman Hassan Ismail told the official SUNA news agency. The United States renewed calls Wednesday for Khartoum to allow peaceful protests. Tibor Nagy, the US assistant secretary of state for Africa, said he was “heartened” at the relative calm overnight Tuesday. “We call on the government of Sudan to respect the rights of all Sudanese people to express grievances peacefully,” he tweeted. On Tuesday, security agents had to abort bids to disperse the crowds when soldiers countered their volleys of tear gas by firing gunshots in the air, witnesses said. Witnesses said troops stationed vehicles loaded with machine-guns at the gates of the army complex, which also houses Bashir’s residence and the defence ministry. Bashir has remained defiant in the face of protests, which erupted on December 19 in response to a government decision to triple the price of bread. They quickly mushroomed into a nationwide campaign against his rule with rallies held across cities, towns and villages. This entry was posted on 11 Apr 2019,11:16AM at 11:16 AM and is filed under mobile-leadstory, Africa. You can follow any responses to this entry through the RSS 2.0 feed. Both comments and pings are currently closed.